OK, so I got this wonderful Burny Custom the other day and I have been asking myself a few questions. Thanks to the forum, I have been able to identify the year. The pots show 94 K on the second line, so I am assuming this was made in May 1989, and the pots are all normal (K). I would say that it is all original (maybe the toggle switch cap should be cream instead of black). It is only missing the pickguard. The pickups are supposed to be VH-3s. The neck pickup sounds really beautiful, but I have a bit of a problem with the bridge and middle ones. -The middle toggle is supposed to invert the phase of the Bridge and Neck PUs, but I am not sure the 3.6 Ohm and extreme volume drop is normal. -Another issue is that the bridge PU on its own is quite lower in volume than the neck, with the neck PU screwed all the way down in its route and the bridge PU all the way up. -Another interesting fact is that when I touch the neck PU, I hear a strong ground hum. I have checked all the soldering and it seems to be correct and firm. -And finally, I suspect that the middle PU was replaced and is not even a humbucker. It sounds hollow on the non-screw side when hit with a pick... It could be a single pickup in disguise. If I replace the middle PU with a decent true humbucker, do you think the Bridge+Middle position would sound louder? Apart from that, the guitar is magnificent. Infinite sustain, although considering it weighs just above 5 KG, I guess it's the least you can ask for. A few picks for your pleasure. Congrats with the nice Burny. I have owned a 1984 RLC-65 3pup before, very nice guitars. Do you have a picture of the back of the middle pickup? Hi Jakko. Thanks! It is indeed very nice. No pictures at present, but I can tell you it has no marks or identifiers whatsoever. Actually, none of the pups have any sort of identification. I should have taken pictures when I changed the strings and removed the pickups for cleaning... Will try to do it soon. 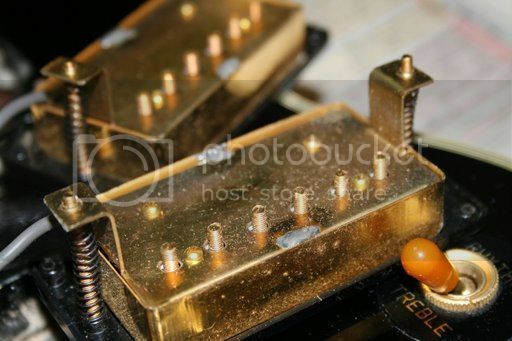 The baseplate colour is indicative for what kind of pickups you have, a VH3 from 1989 will have a brass coloured baseplate and dark grey pickup wire. Further; the pickup wire hole in the basplate should be on the opposite side of the pole screws. This combination of specs is typical only for a 1985-1990 VH3. If my memory does not betray me, your pic looks exactly like what I saw the day I removed them for inspection. I have to confirm, but that'll have to wait a bit. I've been inspecting the wiring again and I believe the middle pickup is not a VH3, based on the info you gave me yesterday. The pickup wire sleeve is white! Fortunately, the other two are indeed gray. This is what the switch looks like. The middle pickup (white sleeve) is connected to it instead of to the controls. In case anyone is interested, I managed to find a correct VH pickup for the middle position from another Burny Custom, installed it, went through the crazy wiring from the previous owner and sorted everything out. The thin sound was because of the crappy PU someone had installed in the middle position and due to the wiring having been inverted to produce a sort of out of phase effect. I am now a very happy owner of an excellent guitar, although a bit too heavy to carry around more than 20 minutes (6 Kgs).